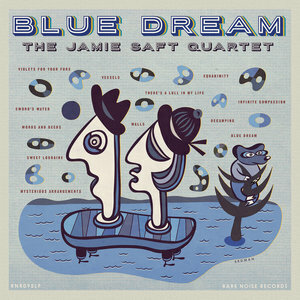 The usually wildly eclectic keyboardist Jamie Saft uses his traditional acoustic jazz quartet to construct an argument that the old tools can be used in perfectly free, new ways. This range and breadth of interests can make it hard to write about Saft. Better to write about the music itself, which in the case of Blue Dream, his latest recording, is an intriguing pleasure. This is a date for a traditional jazz quartet with Bill McHenry on tenor sax, Bradley Jones on bass, and drummer Nasheet Waits. Saft plays one keyboard only: the piano. The tunes happen to include "Sweet Lorraine" and "Violets for Your Furs", two old standards. So the initial question has got to be: how does a session built roughly around tradition still embody Saft's mile-wide musical vision? On the standards, the band is remarkably straight. "Sweet Lorraine" is read gently and without solos, and "Violets" is played as a swung ballad, McHenry putting across the melody in his breathy low register, followed by a piano solo from Saft that is a model of elegance and simplicity: a patient, bebop-styled single-note right hand working against rung left-hand chords. "There's a Lull in My Life" is taken at an almost solemn stroll, sounding for all the world like a slice of classic modern jazz circa 1955 or so: closer to the first Miles Davis Quintet than any other model. All the players, including the leader, keep it straight, clean, clear, classy. So how does Blue Dream reflect a more modern sensibility? Listening to the album as programmed, Saft's subversive sense of history emerges. The three standards are sprinkled across a program that uses the acoustic quartet format to assay several other styles and sensibilities. When the standards arrive, it's in the context of more daring music being spoken in the language of classic jazz, even if these other performances come from a more untamed place. For example, the first standard is preceded by three originals, each of which has no written melody, but each distinctive and different. So, "Vessels", which opens the collection, creeps toward us as a slinky minor throb, Waits's hi-hat clattering like nervous teeth, Jones's bass all bottom, and Saft low and clanging like bass chimes—no melody, just a chance for McHenry to testify, gently at first, then rising, then growling, eventually moving outside the song's mode to become just sound that fades into the distance, giving the foreground to Saft. "Equanimity" follows, starting with a drum solo that bleeds into a swing major chord pattern that still has no melodic head. McHenry and Saft both improvise with a post-bop blend of harmonic consonance and joyful freedom—Saft patricianly seems unconcerned with notes that splash outside the traditional harmonies, even though he always pulls the line back to heal eventually. This one, while free, is sunshine. "Sword's Water" is a pure rumble from the rhythm section for almost four minutes: thunder approaching while McHenry blows mad above like the wind. No shrieking, but a storm nevertheless. Only then does this band play "Violets for Your Furs" as if they were in a quiet restaurant. These little suites recur three times over the course of Blue Dream. The free-bop swinging piano trio, with a long Jones bass solo, is the title track (still no written melody), taking your ears to the meditative "Infinite Compassion" on which McHenry plays a very Coltrane-ish theme: simple and yearning, but mostly a launching pad for tremulous tone and reaching upward toward ecstasy. And then we get the swinging, improv-free "Sweet Lorraine". The third such "suite" contains four originals that trade in varying degrees of modern freedom before concluding with that one last traditional performance. Of this batch, "Decamping" is particularly enjoyable—a tension-and-release theme that finds Waits and Jones pushing and pulling each other with playfulness. "Mysterious Arrangements" begins with a free section that moves into a tricky but funky baseline for Saft's filigreed improvisation. Taken as a whole, Blue Dream makes a clear statement about how creative musicians can take a tradition and goad it into something new, something different. A band can use more modern tools to make daring music, but the old tools will do just fine if imagination is at play. Indeed, by the time the band gets to its last song, "There's a Lull in My Life", your ears may even hear that fairly traditional piece as modern because the language and methods of the Jamie Saft Quartet should have subtly changed your hearing just a bit. New is old is new again. The modern jazz tradition of 1950s Miles Davis bands was super-hip in its day, after all. And Jamie Saft is here to assure you that modernity never sounded so good as when it wore a tux and got weird all the same.